In this article we will describe briefly the main events in the life of the great Rāmānujācārya, the practical founder of the Viśiṣṭādvaita system, referring to the names and characteristics of the most important of his immediate followers, and shall conclude with a short summary of his philosophy as disclosed in his works. As you may notice - already one longer and more detailed account on Rāmānuja’s life has been published on this pages named Rāmānuja Ācārya – biography and legend. The present article is a shorter and more condensed version of the same and may be convenient for people in hurry or for those who would like to make sure they have not lost some important details. We have seen that by the end of the 10th century A.D., Viśiṣṭādvaita had greatly developed under Yamunacharya and had obtained a strong foothold in Śrīraṅgam with Kānchīpuram, Tirupati, and a few other places, as rallying centres for the followers of this creed. Yamuna felt that among his immediate followers, there was no one who could exactly fill his place as the head of the New Dispensation. He, therefore, cast his longing eyes around among the younger men and surmised from personal observation and general report that the young Rāmānuja, then a pupil under Yadavaprakasa, was, by intellect and character, the fittest person that could succeed him. He did not, however, wish to precipitate matters, but allowed them to take their own course, trusting that, under the guidance of Providence, all would end well. Śrī Śailapūrṇa, a disciple of Yamunacharya, was established at Tirupati Hills, in service at the Temple of that place. He had two sisters, one of whom, Kantimati was married to one Keśava Somayaji of Śrī Perumbudur about 10 miles from the Trivellore Railway Station, near Madras. This lady gave birth to Rāmānuja, about the year 1017 . A.D., and the uncle, Śrī Śailapūrṇa came down from the hills and was pleased at the benign and intelligent face of the child. He looked after the boy carefully and duly got him invested with the sacred thread at the proper age. After the usual preliminary studies in which Rāmānuja, as may be expected, showed great capacity, a teacher, Yadavaprakasa by name, was selected for the higher course, and Rāmānuja duly went to study with him. Here he was joined by a cousin of his, another nephew of Śrī Śaila, and the two, in the usual fashion of the day, boarded with the teacher and acquired proficiency in the secular śāstras. When it came to the study of philosophy or the Upanishads, Rāmānuja found his master's explanations unsuited to his taste. He took objection to the interpretation of more than one passage, and suggested his own meanings, which hardly pleased the teacher. A coolness arose in consequence between master and pupil; we are told that the former, in combination with the other pupils, formed an unholy conspiracy to take Rāmānuja on a long journey to Benares and get rid of him there. The unsuspecting Rāmānuja accompanied the party, but while travelling in the jungles of the Vindhyā outskirts, his cousin Govinda Bhaṭṭa, into whose ears the news of the nefarious intention towards Rāmānuja had oozed, warned him of the impending danger and bade him escape somehow. Rāmānuja, in sore straits, struck into a by-path and lost his way. The party proceeded without him and discovered, when too late, that he had slipped away. In great distress and much fatigued, Rāmānuja wandered over the thickets, for a long time, unable to decide upon his course. He then met, as if by chance an old hunter and his wife, and of them he inquired the way. They said that they were going to the Satyavrata Kshetra, i.e. Kānchīpuram, and bade him follow. The three travelled all the night. Towards dawn, the old man asked Rāmānuja to fetch some water from a neighbouring well. When Rāmānuja came back with the drink, the pair had mysteriously disappeared, and Rāmānuja found to his wonder and delight that he had miraculously reached Kānchī itself, the tower of whose temple was visible to his eyes. He sped home, feeling sure that God in his mercy had come to his help. In due course the party of Yādava reached Kānchīpuram after their travels and surprised to find Rāmānuja, made up to him, as if nothing had happened. Rāmānuja resumed his studies with Yādava, as before, but with some hesitation. The Advaita interpretations displeased him more and more. The spirit, however, bowed to Rāmānuja who accompanied Yādava, expressed its opinion of his greatness and departed in respect to his wishes. This incident embittered Yādava towards Rāmānuja who had finally to give up his studies under such an uncongenial master. Rāmānuja then attached himself to the service of the Devarāja Perumāḷ at Kāñchī where Kāñchīpūrṇa, a non-Brahman disciple of Yamunacharya, was in daily attendance on the God. This devotee had the reputation of being in close touch with the God of his worship, who, it is said, assumed the ways of men towards the favourite and held discourse with him in human language. Meanwhile Mahāpūrṇa, a disciple of Yamuna, who had been dispatched by the Āchārya and his followers to persuade Rāmānuja to go to Śrīraṅgam and formally accept the new faith, reached Kānchīpuram for the purpose, and with the help of Kāñchīpūrṇa succeeded in his object. Rāmānuja gladly agreed to pay his respects to the far-famed Yamuna and the two started towards Śrīraṅgam. and Rāmānuja ascertained, to his irreparable sorrow, that the great Yamuna had breathed his last and was being buried with holy honours on the banks of the Kāverī. Rāmānuja hastened to have a last look at the body of the great guru and was surprised to see that three of the fingers of his right hand were closed in a deadly grip. They replied that shortly before death, the veteran teacher had expressed three wishes and had closed his fingers in the act of counting them. The wishes were that a Viśiṣṭādvaita Bhāshya should be composed on the Sūtras of Vyāsa, and that the names of Parāśara, the author of the Vishnu Purāṇa, and of Śrī Caṭakōpaṉ should be perpetuated as a mark of gratitude to the two great men named. Deeply affected, Rāmānuja proclaimed that, God willing, he would undertake the duties named and accomplish them speedily. No sooner was this statement made than the fingers opened out, we are told, of their own accord, and the assembled Vaishnavas herein read a sure sign of the coming greatness of the young man who stood before them. Rāmānuja duly attended the obsequies of Yamunacharya but left Śrīraṅgam immediately after, and reaching Kāñchī, resumed his duties there, in the I company of the pious Kāñchīpūrṇa. Rāmānuja was deeply impressed with the saintly character of this man and felt drawn towards him. Not caring for his inferior social status, he invited him for meals in his house and instructed his wife (for he had now married and had set up house-keeping for himself) to prepare food for him. The Pūrṇa, after his temple services, went up to Rāmānuja's house and being pressed for time, took his meals at once and departed, leaving word for Rāmānuja who was away, that business called him back so suddenly. Rāmānuja returned and saw his wife clearing the leaves on which the Pūrṇa had taken his food, and washing generally the place and bathing herself to get rid of the impurity of the Śūdra’s contact. Rāmānuja, who had, out of piety and respect, intended _to wait upon Kāñchīpūrṇa and eat after he had dined, (a thing unusual for a Brahman) felt greatly disappointed. He gently rebuked her for her illiberal spirit and felt that he was ill-matched in her. Yamuna’s death at Śrīraṅgam had left a void which his disciples were anxious to fill up; and old Mahāpūrṇa was again dispatched to bring Rāmānuja. As chance would have it, Rāmānuja also thought of going up to Mahāpūrṇa for spiritual instruction, now that Yamuna was dead, and actually commenced his journey south. The two met at Maduranthakam, and the impatient Rāmānuja requested Mahāpūrṇa to instruct him in the mantra of the Vaiṣṇavites immediately. Mahāpūrṇa complied, and the two proceeded to Kāñchī, where Mahāpūrṇa (and his wife who had accompanied him) lodged in Rāmānuja’s residence. Rāmānuja pursued his religious studies under the new guru and had a happy time of it. This was, however, marred by a petty quarrel which arose between the ladies, and Mahāpūrṇa, afraid that Rāmānuja will take it too much to heart, if further ill-feelings arose, suddenly left Kāñchī with his wife and proceeded to Śrīraṅgam. Rāmānuja, who was away at the time of the incident returned and finding from enquiry that his wife’s pettiness was mostly to blame for the quarrel, felt sorely the affront to his master and feeling displeased with her altogether, sent her to her father’s home finally, resolving to abandon the house-holder’s life. He went to the presence of the God of Kāñchī and there, with due ceremonies, donned the red robes of the Hindu Sannyāsin, and thus broke all his family ties. A native of Kuram, a neighbouring village was the first to be drawn to him. Kureśa, as he was called, was a wealthy and learned Brahman and became a life-long friend and follower of Rāmānuja. Dāsarathī, the sister’s son of Rāmānuja, was another who came to him and was one of his most beloved pupils ever after. Other persons sought him out, became his pupils and accepted his teachings. Yādavaprakāśa, his old teacher, was, we are told, persuaded of the error of his views, and abandoning his tenets and position as an advaitic Sannyāsin, voluntarily chose to be converted under name of Govinda Yati and counted himself among his supporters. He composed a work on the duties of Sannyāsins (Yatidharma Samuchchaya) which exists to this day. We have no means of ascertaining whether this Yadavaprakasa is identical with the one mentioned in the Bhāshya and later works, as the author of the Bheda-abheda doctrine allied to the Bhāskara school; but tradition asserts that the two are identical. There is no allusion in any of the existing texts of Rāmānuja that the Yadavaprakasa under whom he studied and whom' he later on converted was anything put a pure Advaitin of the Śankara School. If this Yādava had developed a new philosophy materially differing from Śankara’s, it is strange that no allusion is made to that fact in the existing lives. It is, however, certain that Rāmānuja did controvert and defeat a Yadavaprakasa in his life-time, for both Anthrapūrṇa, contemporary and disciple of Rāmānuja, and Vedanta Deśika, a follower of Rāmānuja. who lived in the 14th century, testify to the truth of this fact in their respective works, laudatory of Rāmānuja. To proceed: At this juncture Rāmānuja had another call from Śrīraṅgam which he, willing to take his place as the leader of the community, gladly accepted, and started south. He took Dāsarathī with him and reaching the outskirts of Śrīraṅgam was met in advance by an eager concourse of devotees who took him in procession to the quarters intended for him and installed him formally as their spiritual superior in the seat of Yamunacharya. This was nothing less than a report at Kānchīpuram that the rumbling noise of his huge palatial gates closing at nights disturbed the God at Kāñchī. Kureśa was ashamed of the vanity which the rumour implied and abandoning all his wealth to the poor, went with nothing but the clothes he wore and his wife similarly clad, to join Śrī Rāmānuja at Śrīraṅgam. There he adopted the life of a mendicant and lived on the alms which he begged from day to day. His uncle Śrī Śaila, at Rāmānuja’s request, converted him after some trouble and brought him over to Tirupati. Later, he joined Rāmānuja, assumed the garb of a Sannyāsin and became an important disciple under the name of Embar. 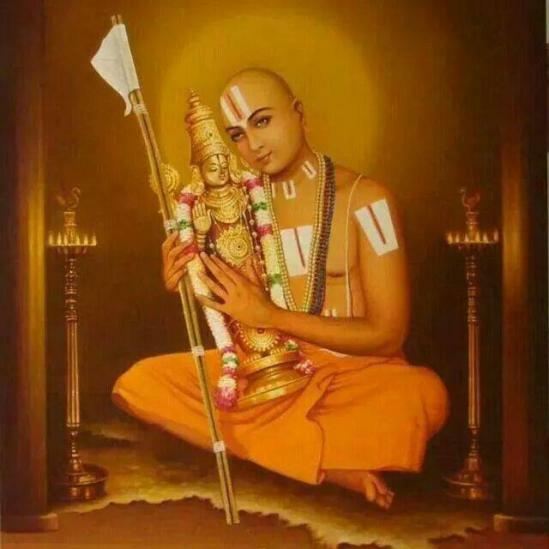 About this time Rāmānuja defeated in controversy and also converted an Advaita scholar, Yajñamūrti by name, who became a Sannyāsin on his defeat and Rāmānuja’s disciple under the style of Devarāja Muni. who were the pupils of Yamunacharya, and specially held in reserve, as it were, instructions intended for Rāmānuja. One of them was Goshtipūrṇa, who, after trying Rāmānuja eighteen times by compelling him to travel all the way from Śrīraṅgam to the Madura District, where his place was, at last deigned, after exacting promises of secrecy, to impart to him certain important teachings. Rāmānuja once in' possession of them, straightway called together a group of men and proclaimed loudly the truths he learned with so much difficulty. The furious guru asked him to explain his conduct, and Rāmānuja said that he did not care if perdition was his fate for the transgression, but that he valued more the saving of men’s souls. Thus did Rāmānuja open out the hearts of even his conservative teachers and prepared the way for the breakdown of narrow prejudices. The other teachers of Rāmānuja also found that he had more to teach them than they had to impart. Such were Maladhara and his uncle Śrī Śailapūrṇa. The latter instructed him in the truths of the Rāmāyaṇa in the course of an extended visit of nearly a year which Rāmānuja spent at Tirupati for the purpose. One of the first works that he composed was the Vedārtha Saṅgraha wherein he tackled the principal Upanishads that lent themselves to Advaita interpretation, established the unsoundness of such interpretation, and expounded his own views. The very first of such passages is the famous one of the Chāṇḍogya Upanishad wherein occurs the enigmatic sentence, “Tat tvāṃ asi,” ‘that thou art’ which is the corner-stone of all Advaita expositions. He also attacks in this work the doctrine of Māyā of Śankara, and the Bheda-abheda doctrines of the Bhāskara and Yādava schools. Then he set out his view of the ultimate truths and gives his method of reconciling Vedic passages. and concludes by establishing that the former alone is explicitly named as the Deity in both his personal and impersonal forms. This controversy of names, it will be seen, is independent of the dispute between Advaita and Viśiṣṭādvaita and there are plenty of confirmed Advaitins to whom God as Vishnu or Nārāyaṇa is the object of worship. Rāmānuja now addressed himself to his magnum opus, the Bhāshya on the Vedānta Sūtras. We have explained on a previous occasion that Rāmānuja’s interpretation followed the Bodhāyana Vṛitti, a very early gloss on the Sūtras composed long before Śankara’s time and essentially representative of the very views which Rāmānuja expounded. To get at the manuscript of the Vṛitti, which was unavailable in Southern India, Rāmānuja, it is said, had to travel to Kashmir with Kureśa and other pupils. With considerable difficulty, he obtained permission to read the manuscript but not to take any copy of the same. Kureśa of wonderful memory committed to heart important passages in the simple act of reading them once and relieved Rāmānuja of all anxiety as to his being unable to make a copy of the work and take it with him. The party then returned to Śrīraṅgam and Rāmānuja composed the Bhāshya, Kureśa being the assistant. but where any error crept in, in the nature of a disagreement with the Vṛitti, he simply would not write down any further, and Rāmānuja took the hint and usually amended the text. or lastly, we may suppose that the work was really composed after his return from his long trip and Rāmānuja utilised the study of the Vṛtti in the composition. The Śrī Bhāshya is the work of a mature intellect, and there is nothing improbable in supposing that Rāmānuja’s views, settled by the ordeal of frequent controversies firing his trip, were committed to writing, after his return, in deliberation. After the composition of the Śrī Bhāshya, Rāmānuja composed two epitomes of the same, a short one, the Vedanta Sāra containing the Sutras and a simple gloss, and the Vedanta Dīpa, a work on the same model, but fuller in discussion and exposition. Both works are valuable aids to the study of the Sūtras and deserve to be better known, though it must be admitted that they are thoroughly eclipsed by the masterly Śrī Bhāshya. Rāmānuja also composed a commentary on the Bhāgavad Gītā, known as the Gītā Bhāshya, a work of great merit, the result of considerable thought, which has since been amply expounded by the classical commentary Tātparya Chandrika of Śrī Vedanta Deśika. The other works of Rāmānuja are the Gādya-traya and the Nitya, works devoted to practical religious purposes and requiring further notice. With a large following of disciples and with the express object of visiting various shrines and incidentally controverting opposition to his views, wherever it may arise, Rāmānuja started from Śrīraṅgam. He first travelled east, visited Kumbakonam and the shrines of the Shiyali Taluk near the scene of Thirumangai Āḻvār’s birth. He then turned south and visited the shrines of Madura and Tinnevelly (Tirunelveli) and in the latter district visited Āḻvār-Tirunakari and the neighbouring shrines where Śrī Caṭakōpaṉ was born and lived. From here he went to Rāmeśvaram. Returning to Tirunakari, he went to Malabar and Travancore, visited various Vishnu shrines scattered over these places and then marched northwards along the sea- coast to Girnar and Dvārakā in Gujarat, where Śrī Krishna lived and ruled. Thence he went to Muttra, Govardhana, etc., places sacred to the memory of Śrī Krishna. From these he went further north up the Himalayas to Badrināth. He then visited Kashmir and stopped at Srinagar, where he is said to have been challenged by Saraswati herself, the Goddess of learning. The word Kapyasa has been interpreted by Śankarāchārya as the “posteriors of the monkey." Śankara gave this apparently literal interpretation, unaware of any other traditional interpretation, and excused the obvious awkwardness of the comparison by saying that it was only a simile subsidiary to another simile and was, therefore, of no harm. It will be seen that, apart from the unseemly comparison, Śankara requires the interpolation of another word ‘like’ for which the text gives no room. The text naturally implies that ‘Kapyasa’ is co-ordinate with ‘puṇḍarīka’. This derivative meaning had been suggested to him by one of the early commentators, the Vākyakāra Tanka, referred to before in the life of Yamunacharya, who interpreted ‘Kapyasa’, as “full-blown by the rays of the sun”. Rāmānuja improved upon this interpretation by exhausting the possibilities of derivative construction afforded by the word and which seemed suited to the context. This interpretation of Rāmānuja thoroughly satisfied Saraswatī, we are told, and She blessed him and his Bhāshya. Rāmānuja, however, roused the ire of the advaitic pandits of the place, who, defeated in open controversy, tried to encompass his life by dark means. Rāmānuja and his party, however, escaped and descending the Himalayas, proceeded to Benares. From Benares he travelled south-east and reached Puri or Jagannāth on the eastern coast and established a mutt there. A dispute was raging at the time of Rāmānuja’s visit as to whether the God was Vishnu or Śiva. It is claimed by the Vaishnavas that the God was Vishnu in the times preceding that of Rāmānuja, as the Śaiva saints dedicated no stanzas to him, though neighbouring Śiva shrines were noticed. It also appears that in the times of an early Āḻvār who preceded Śrī Caṭakōpaṉ, the God is described as wearing both Vaiṣṇavite and Śaivite symbols. A fruitful source of dispute seems to have existed in the place based on this dual aspect. It may be that in Rāmānuja’s time there was a fresh attempt to oust the Vaiṣṇavites. It was now suggested that both Vishnu and Siva symbols should be placed before the God at night and that the decision as to the God’s nature should follow any indication that He may give in the matter. This was done by Rāmānuja and the people of the place, with the result that, early next morning, the God was seen wearing the discus and the conch, the symbols of Vishnu, to the neglect of the symbols of Śiva also placed before him. Thus ended a controversy, which has never cropped up again. From Tirupati Rāmānuja travelled south, visiting Kānchīpuram, Tirukkōḷūr, and Tiruvahindrapuram (Cuddalore) and lastly Viranarayanapura, the birthplace of Nāthamuni. He then reached Śrīraṅgam after completing successfully an extended tour of several years, during which he acquired great fame and largely increased his influence. With great tact and ability he managed through his disciples the affairs of the Śrīraṅgam Temple entrusted to him, and at the same time instructed his followers and ministered to their spiritual wants. His congregation included, we are told, 700 Sannyāsins, 74 dignitaries holding special offices of ministry, and innumerable holy men and women who revered him as God. Rāmānuja was now an aged man near 70, but was destined to live many years more and instruct his contemporaries. He was fond of his disciples and they reciprocated the feeling. One of them, a son of Śrī Śaila, his uncle, was bred up as a son to him and named Kurukeśa, after Śrī. Caṭakōpaṉ, in fulfilment of the pledge to Yamuna's spirit, which we have mentioned before. By the composition of the Śrī Bhāshya, he had redeemed another of the pledges. The third pledge was redeemed by Rāmānuja naming a son of his friend Kureśa as Parāśara, the name of the saintly father of Vyāsa and the author of the Vishnu Purāṇa, which is held in great esteem. Kurukeśa, otherwise named Piḷḷāṉ, composed a monumental, though brief, commentary called the Six thousand, on the 1,000 stanzas of the Tiruvāymoḷi, of Śrī Caṭakōpaṉ. Parāśara Bhaṭṭar, son of Kureśa, was a brilliant man, almost a prodigy and has composed various works, one of them being a commentary on the Sahasranāma called Bhāgavad-guṇa Darpaṇā. The Chola King (Kulothungachola I), persuaded by the bigoted Śaivites of his Court, sent for Rāmānuja to ask him for a subscription of his faith in Śiva as the Supreme Lord. Kureśa, personating Rāmānuja, accepted the summons, wore his master's red robes and went in his place, accompanied by the aged Mahāpūrṇa, Rāmānuja’s earliest teacher. The two reached the Court of the monarch (at Chidambaram in all probability,) and attempting to argue out the superiority of Vishnu, were commanded by the cruel monarch to have their eyes cut out. This was done and the unfortunate pair stumbled out somehow and started for Śrīraṅgam. On the way Mahāpūrṇa died, unable to bear the pangs of pain, and Kureśa reached Śrīraṅgam alone. Finding the place closed to Vaiṣṇavites, he repaired to Madura where he lived near the shrine of Tirumāliruñcōlai, a Vishnu temple of great sanctity. Meanwhile Rāmānuja with a sprinkling of his followers left Śrīraṅgam in fear of persecution and by hurried and nightly inarches reached the outskirts of the Nilgiri hills. After great difficulties and many adventures, the party travelled across the forests, and reached Vahnipushkarini, a place on the Kāverī about 40 miles west of Mysore. Thence the party went east, halting at Mirle and Saligram, about 10 miles eastwards. Here Rāmānuja spent some time converting a large number, and one Anthrapūrṇa among the rest, who became a devoted follower thereafter. The party then reached Tonnur or Tondanur, where then resided the King Bitti Deva, of the Hoysala dynasty who ruled in modern times Karṇāṭaka territory, whose capital was Dwara Samudra or the modern Halebidu. These events may be assigned to about the year 1088 or 1089 A. D., when Rāmānuja was over 70 years old. The Rajah's daughter was possessed and the King and Queen were sore distressed on that account. A common acquaintance suggested Rāmānuja as capable of exorcising the devil by the power of his austerities. Rāmānuja was invited to the place and luckily succeeded in curing the Princess of her malady. The King and Queen were greatly pleased. Rāmānuja, taking advantage of an affront which the Jain community to which the King belonged had offered to the latter, converted him to Vaishnavism and changed his name to Vishnuvardhana. It is said that Rāmānuja, plied with the impatient questions of thousands of Jains on all sides, got inside a curtain, and assuming the form of a thousand-headed Ādiśeṣa, answered each one, individually and so effectively, that the clamorous rabble fled away in terror. Rāmānuja established himself in Tonnur and had a large and beautiful lake constructed out of the waste materials of the despoiled Jaina shrines; the lake exists to this day and is called the lake of pearls. Rāmānuja’s stay in Mysore extended over nearly twenty years. He succeeded in creating a strong and learned Vaiṣṇavite community whose descendants exist to this day. He built the temple of Vishnu at Melkote or Tiru-Nārāyaṇa-puram, a few miles north or Mysore, and established in it the God Nārāyaṇa whose statue was discovered by him on the spot, from the revelations of a dream. He also recovered a copper icon, Rāma-priyā, of the same God, which he learned, also from a dream, to be with a Muhammadan princess at Delhi and procured it, after an arduous journey to that place. The panchamas of the place were of great help to him in this business and he assigned them in gratitude certain limited rights of entry into the temple on fixed days, which privilege is enjoyed by them to this day. He then set up, with the help of his disciples, various other images at Belur and other places, and established a procedure for worship on a firm basis in all of them. He resumed his religious instruction as at Śrīraṅgam in peace and serenity, enjoying the favour of the ruler and the devotion of his old and new followers. He went to Padmagiri, (Śravaṇa Beḷagoḷa) the Jain stronghold, and there obtained victories in argument over the Jains of the place and converted a large number. Meanwhile news had reached him that the Chola King who persecuted him was no more, having fallen a victim to a serious carbuncle. He also heard of the misfortune of Kureśa and the death of his venerable teacher, Mahāpūrṇa. Sorely grieved, he longed to return to Śrīraṅgam, and console Kureśa and his numerous old followers. He, therefore, implored his Mysore friends to let him depart, which they did after getting an exact image of Rāmānuja, which they set up for worship. He then started for Śrīraṅgam and reached it, travelling in rapid marches in the company of a large group of disciples. The people of Śrīraṅgam welcomed him with open hearts and conducted him to his mutt in triumphal procession. The successor of Koluttunga I was a pro-Vaishnava ruler and Rāmānuja was left undisturbed. Rāmānuja met his affectionate follower Kureśa, now blind and decrepit, and shed tears of the deepest sorrow over his misfortunes. Learning that the God Govindarāja, removed from Chidambaram under the orders of the late Chola ruler, was preserved in concealment at Tirupati, he journeyed to that place and established a shrine for that deity at the foot of the hills. He then returned to Śrīraṅgam and resumed his saintly life. After some more years of useful work, he closed his long and active career quietly at Śrīraṅgam, in the year 1137 A. D., having lived for 120 years, a span of life unusual among men, but which, we are assured from all accounts, was a historical fact in his case. It must be added that his devoted follower Kureśa died a few years previously, deeply mourned by Rāmānuja himself and by all around him. There are various incidents in his life (which space forbids us to mention) that bring out his broad-mindedness, burning sympathy for mankind, unselfishness to an extraordinary degree, resourcefulness and absolute devotion to God. He went further than any other Vedic teacher in recognising merit even though combined with socially inferior birth. He was an able interpreter of the human heart, and won men and women of different temperaments to the path of religion by suitable sympathetic treatment. His writings show the keenness of his intellect, the vastness of his learning, and the sincerity and seriousness of his character. His moderation in controversy is remarkable. He has no harsh word anywhere for his opponents. His disciples were the ancestors of innumerable Vaishnava families throughout the Presidency who deem it their highest honour that they are so descended. That the Vishnu temples are places of large resort and centres of social and religious influence is due entirely to his initiative and prudent fore-thought. In distant Bengal, a pupil of his was succeeded by the well-known Rāmānanda who preached Vaishnavism and Bhakti, and has created many thousands professing the Vaishnava cult in Bengal and other parts of the North. Rāmānuja, preceded and followed as he was by various reformers of eminence in his own line, is rightly held to be the founder of the Viśiṣṭādvaita system.